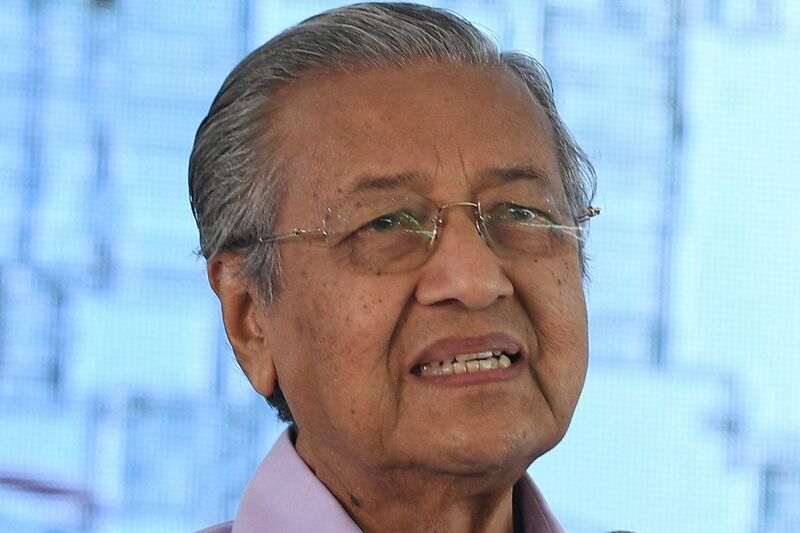 PUTRAJAYA • Malaysian Prime Minister Mahathir Mohamad yesterday urged the government and people of Johor to speak up against what he felt was a "morally wrong" water agreement with Singapore. The "rich" country of Singapore has been benefiting from "poor" Malaysia on the water issue, he told the Johor government's retreat with the federal Cabinet in Putrajaya. "Singapore rapidly developed because we have been supplying them with water, but I find the Johoreans rarely talk about it," Tun Dr Mahathir was quoted as saying by the Bernama news agency. "They just wait for negotiations to be undertaken by the federal government as if the state government is unaffected... The state government must make their voices heard. The rich are depending on the poor? This is not only illogical but also morally wrong. We must put stress on this issue," he added. He was quoted by the Malay Mail online news as saying: "Not just the federal government, not just our negotiators, but the people of Johor must also pressure, saying that Singapore is exploiting Johor's water." He added, as quoted by the news site: "Singapore depends on Johor for electricity, water and all that. If we manage these well, we will get enough profit. "However, now, since 1926, we sell water to Singapore at the price of three sen for 1,000 gallons - not litres, but gallons. Singapore rapidly developed because we have been supplying them with water, but I find the Johoreans rarely talk about it. They just wait for negotiations to be undertaken by the federal government as if the state government is unaffected... The state government must make their voices heard. "This is the price of 1926, but even now, Singapore is still paying three sen for 1,000 gallons of raw water from Johor. We have to fight this, but it seems we are not that smart in defending or highlighting the mistreatment that is happening to us." The water issue with Malaysia resurfaced in June last year, a month after the Pakatan Harapan government took office, when Dr Mahathir said the price of raw water sold to Singapore was "ridiculous" and that Malaysia would approach Singapore to renegotiate the terms of the agreement. Under the 1962 Water Agreement between the two countries which expires in 2061, Singapore is entitled to draw up to 250 million gallons a day (mgd) of raw water from the Johor River at three sen per 1,000 gallons. Johor is entitled to buy five mgd of treated water from Singapore at 50 sen per 1,000 gallons. Singapore has said this price is heavily subsidised and below the cost of treating the water. Singapore's stance is that in 1987, Malaysia lost its right to review the price under the 1962 Water Agreement when it chose not to do so. Speaking about the water issue and referring to Singapore, Dr Mahathir was quoted by the New Straits Times newspaper as saying: "How can such a rich nation with higher per capita income of US$18,000 (S$24,300), compared with us, with per capita income of US$10,000, pay such an unreasonable rate?" Dr Mahathir claimed that Singapore is also making profits with the high pricing of its desalinated water, yet still pays Malaysia only three sen for the raw water, Malay Mail quoted him as saying. The Prime Minister said Johor should play up its strategically located ports and lower costs to entice Singaporeans to invest and shop there.